When a university admissions rep visits your school, it’s a chance for students to ask questions and resolve concerns. Here’s how to make the most of them. We’ve already discussed how students can take advantage of of university open days and paying visits to university campuses when researching their future options. Make the university admissions process seem more open and more personal, with students given the chance to talk to a university rep in a smaller setting. Give students the chance to ask valuable questions about a university’s admissions process that will strengthen their eventual applications. Allow students more insight into a university destination that they may not have previously thought about applying to. And it’s an opportunity for you too. Guidance counselors, or other members of staff responsible for the university admissions process, can use visits from university reps to build bridges between their school and higher education institutions. This can help to nurture valuable long-term relationships between schools and universities, and ensure that both parties are more invested in students’ ultimate application outcomes. So we’re going to take a closer look at visits from universities: how they work, why they’re such a useful part of your student’s research process, and how your students can make the most out of them to bolster their university applications. How can my students connect with university admissions reps? It’s now very common for universities to send representatives to tour secondary schools, and because universities are becoming increasingly global when it comes to student recruitment, many will send representatives abroad to international schools. This offers students of these schools a personal insight into university destinations that may, at first glance, seem very remote and inaccessible. Many universities will schedule visits to school campuses. These are an absolutely invaluable opportunity for students to find out about the admissions process in a familiar setting. Some universities will even offer talks or workshops that are tailored to a particular year group within your school. Many universities will schedule regional and international tours, appearing in cities and towns at various university and college fairs. Again, a quick glance at university websites will often give you and your students an insight into where and when is a good opportunity to meet with a rep from a given institution. University/college fairs also give students the opportunity to get an overview of multiple destinations at the same time. It’s worth noting that many universities (for example Dartmouth) will be both touring regionally/internationally and offering direct visits to schools. It’s worth researching and contacting each university individually to see what they can offer you and your students. As with open days or campus visits, meeting a university rep is an important opportunity for students to give focus and shape to their research. So whether it’s at a fair or at a school, it’s important for students to make the most of these one-to-one conversations. What programs/courses does the university offer that align with their subject interests? What are housing/accommodation options like for undergraduates? What’s the social life like on campus? What’s the surrounding town/city/wider area like? If it’s a campus based university, what are transport links like? What makes this university unique? What does this university look for in prospective students? Not only is a university rep going to be more impressed by students who are already engaged with the process, these questions will also inform any reflections that students may have after the visit is over. It’s important to impress on students that a visit from, or meeting with, a college rep can help to form a university’s first impression of them as a candidate. So students should make sure that they are authentic and professional in how they present themselves. Little details like a firm handshake, plenty of eye contact and punctuality make a big difference. As we’ve already covered, talking to a university admissions rep can be a way of making the subsequent application process seem less impersonal and unwieldy. It can be a valuable boost to your students’ confidence if they feel like there’s someone at a university they can both talk to, and correspond with. Encourage them to follow up with university reps after a face-to-face meeting or talk, be that via email, Skype or phone. This is another way to give their university shortlisting more focus, because they will have opened up a dialogue with a university rep who can offer them relevant and personalised guidance. What’s more, university reps are on the record saying that they want students to feel comfortable in contacting them after (or instead of) a visit. Note: If for any reason there are time constraints on your students talking to a university rep (e.g. they miss a lecture or talk due to pre-existing class schedules), then starting a correspondence with a university rep is an excellent Plan B. Again, university reps actively encourage this. Guidance counselors also have an important role to play when universities visit a school. So if you’re responsible for the guidance programme at your school, or are tasked with facilitating a university visit, it’s important to bear a few things in mind. In many ways, counselors and university admissions reps are two job roles where it’s essential to have an open dialogue and a good rapport. You’re both important people in a student’s application journey, and universities value their relationship with a guidance counseling teams in schools. Make sure that university reps know all the details of their visit. These include logistics such as how to find your school, when to arrive, making sure they have a suitable space/classroom to meet with students, and ensuring they have access to facilities such as parking and the cafeteria. The curriculum/curricula your school supports. The preferences or aspirations of your current students. Note: like your students, it’s essential to keep a dialogue open with university reps. So make sure you swap emails, social media, Skype or phone details (or all of the above!). Better yet, if you’ve got a business card, make sure they get a copy! Sit in on as many university rep visits as you can – this will ensure your own knowledge of visiting universities is relevant and up to date, and you can pass on any information students may have missed. Ask questions yourself – some students may be shy or may need a bit of help to get a discussion going (especially in a group context). It’s probably worth mentioning that, whilst they won’t be giving students the ‘hard sell’ university reps are at your school to talk about their institution, and make a powerful case for why students might be a right fit for them. It’s your job to help students to be impartial, to critically assess the pros and cons of this particular university, and whether it’s really right for them. You can’t allow them to get star struck. Did they get everything I needed from their conversation? Do they need to follow up in any way? Did this talk/workshop make them really passionate about applying? If they were keen on that university before the visit, how do they feel now they’ve talked to a rep? Is this really the right university for me, in terms of subject preferences, campus fit, and overall culture? 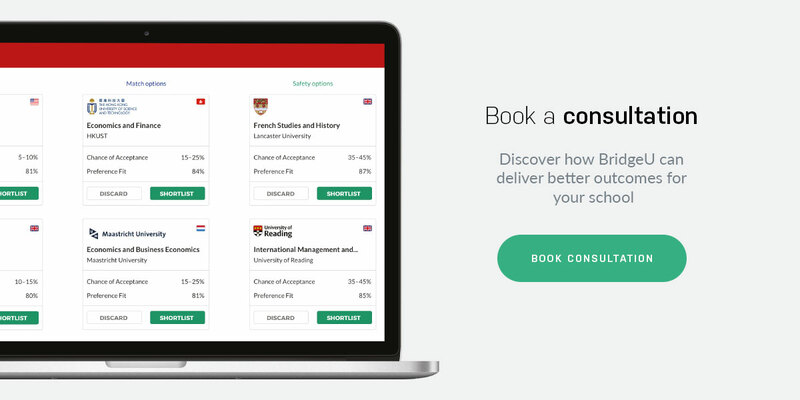 If you’d like to know more about how BridgeU can help students find the right university and course fit for them, book a consultation today with one of our Education Partnerships team.